【Receiver Mode & Transmitter Mode】: Combined with Received and Transmitter modes,simply a button to switch .Transmitter mode,you could turn wired stereos,TV,MP3 player/Computer into a Bluetooth-equipped system to transmitter audio by Bluetooth signal of MK2.In receiver mode,It could connect with 2 devices to play audio. 【Long Lasting Playing Time& Lightweight,Mini 】:with 10 hours battery life,you could enjoy music in a long journey or home leisure time by whole day.The MK2 is only 0.5oz,1.88*1.88*0.38 inch,portable and lightweight. 【Bluetooth 4.1 with Wide Range】: Equipped with the reliable Bluetooth 4.1 for faster and more stable connectivity,even with 33 ft Bluetooth range,make sure a stable and clear audio quality. 【Strong Compatibility】 :The accessories include RCA cable,Audio cable,metal adapter,you could connect with several devices and enjoy a great sound banquet. 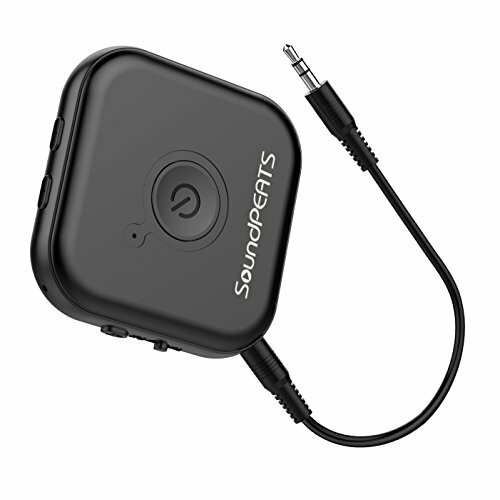 【Phone Call Function and Warranty】:Short press MFB to answer/hand up a phone call,long press MFB to reject a call.SoundPEATS provides 12 month worry-free guarantee warranty.Our customer will try their best to serving you.